An Exceptionally high quality power transformer manufactured by Siemens of Germany. Mounted on an attached bracket are individual fuses for each of two secondary windings and a 25Amp Bridge Rectifier attached to the 28V winding. A 25Amp Bridge Rectifier is attached and connected to Secondary 1 as shown in Fig. A. With addition of filter capacitor, output is 36VDC @ 8A. CCS. 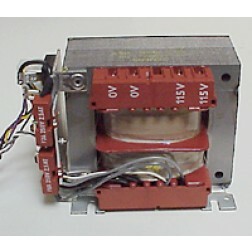 If the 10A fuse is bypassed, the transformer/rectifier is capable of up to 15A ICAS. Full wave rectification of Secondary 2 will yield approximately 24VDC @ 3.5A. Bypassing the 2.5A fuses will give up to 6A ICAS. If Secondary 2 is attached to the primary in “voltage bucking” connection, unit will provide a rectified output of approximately 24VDC @ 15A. Core Size: 4 3/4" x 4" x 2"
We suggest the use of a CL60 Inrush Current Limiter in series with the 115VAC primary.